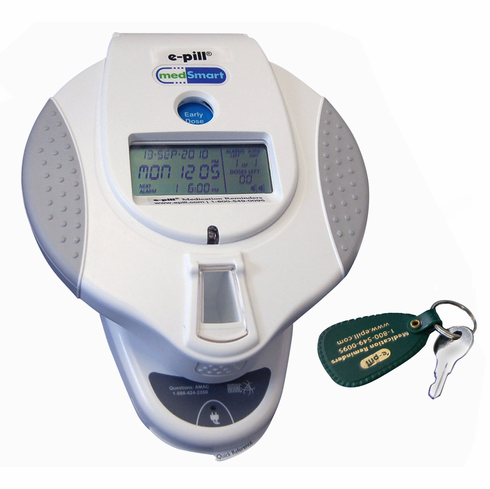 This Robust Medication Management Solution, the e-pill MedSmart Locked Automatic Pill Dispenser with Patient Compliance Dashboard helps ensure that medications are taken properly and on time. All the patient has to do is to wait for the alarm, turn the dispenser over, and dispense the medications. Right Meds, Right Dose, Right Time - Every Time with your e-pill MedSmart Dispenser. This dispenser is automatic, so you only need to set it up once and it will automatically alarm and dispense medications at the same time every day. Never Forget or Double Dose Again! Long Alarm Duration (Indefinitely when on docking station / 90 minutes when on battery power). How-It-Works: The alarm will sound & pills will rotate into position. Lift up the device with one hand, turn the dispenser upside down to allow the pills to fall into your other open hand. All other medicine is inaccessible. The alarm stops when the device is turned upside down (alarm will continue to sound indefinite or stop after 90 minutes if on battery power). Easy to hold with rubber grips. Easy Set-up & Tray Loading: Load the pills in the medication 29 compartment tray (two medication trays are included with your MedSmart system). Each compartment has a capacity equal to 20 Aspirin sized tablets. For added capacity, you may set two alarms for the same time and double the capacity. Set the alarm clock. You can program up to 6 alarms per day. Unique Early Dose feature allows the patient to access medications before scheduled medication time. Great for all tablets, vitamins, and capsules. My patients that are using the MD2 have Dementia. We try them with traditional med-planners first and if they fail we go to the MedSmart. I was skeptical at first thinking they would not remember what to when the alarm went off but I have not had one failure yet. Several of the other Nurses use them and have had the same success. Capacity: Holds 20 Aspirin sized tablets per Dose. Max 6 Doses ('medication events') per Day. Size: 8 1/2 inch (round) x 2 1/2 inch | Weight: 28 oz. Color: White | Keys: Two (2) Metal Keys are Included. Power: AC adapter included. The dispenser is AC powered when the pill dispenser is on the Docking Station.